(TibetanReview.net, Oct27, 2014) – Tibet’s exiled spiritual leader, the Dalai Lama, interacted with scientists as well as students, besides giving public talks, taking part in other panel discussions and giving religious teachings during his visit to Vancouver, Canada, from Oct 21 to 24. He also met with a federal government minister and MPs before leaving for Birmingham, USA. 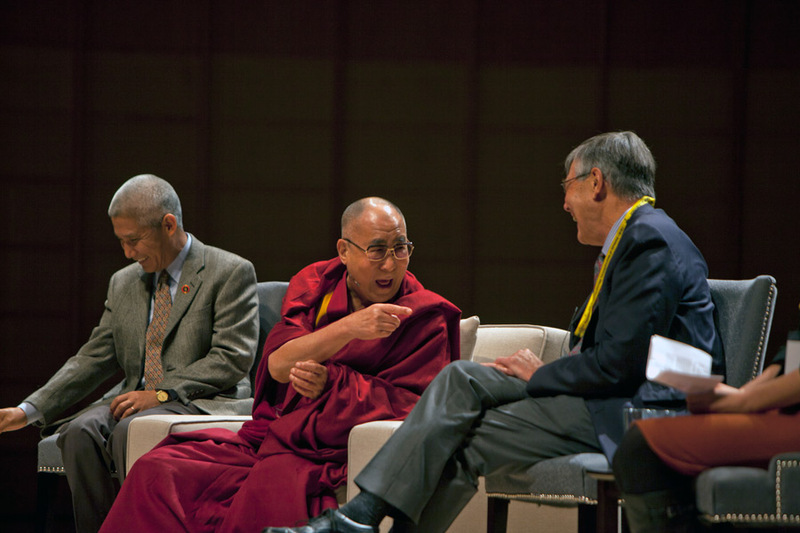 Under the theme of ‘Science of Education of the Heart’, the Dalai Lama took part in an afternoon forum with leading scientists in economics, neuroscience, psychology and public policy at the Vancouver Convention Center on Oct 21. Nearly 3,000 people attended the forum. His first public engagement on Oct 21, however, was at the John Oliver School where he interacted with students on the subjects of gratitude and mindfulness. He later held a discussion on Educating the Heart with a panel of students before an audience of 1400 students, teachers and parents. He later attended a luncheon with 300 community leaders, as well as trustees and sponsors of the Dalai Lama Center for Peace and Education, sponsored by Lift the Children Foundation. He was invited to present three humanitarian awards, after being introduced by Mayor of Surrey, Dianne Watts. On Oct 22, the Dalai Lama took part in a panel discussion at the University of British Columbia’s Chan Center for the Performing Arts co-hosted by the Dalai Lama Center for Peace and Education before an audience of 1,000, mainly students. He also gave a religious teaching in the city on Oct 23 to a congregation of more than 5,000 devotees before traveling to the USA where he is to visit Birmingham, Boston and New York City. While in Canada, the Dalai Lama met with the country’s Employment & Social Development and Multiculturalism Minister Jason Kenney. The Conservative Party senior minister is long known for his support for the Tibet issue. It was a low profile parliamentary meeting with 10 MPs from the Parliamentary Friends of Tibet which also included Revenue Minister Kerry-Lynne Findlay. Mayor of Vancouver, Gregor Robertson, was taken to task by the opposition candidate for not meeting with the Dalai Lama during the ongoing mayoral election. “He should have met the Dalai Lama today,” straight.com Oct 24 quoted NPA mayoral candidate Kirk LaPointe as saying during an Oct 22 debate at Langara College.